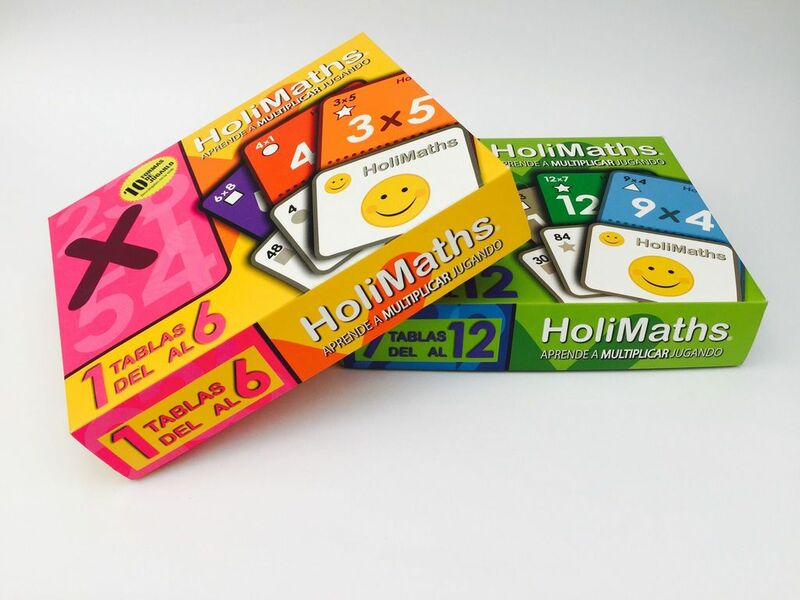 I have the honor of previewing HoliMaths X, with game design by Matias Roman, on Kickstarter now. 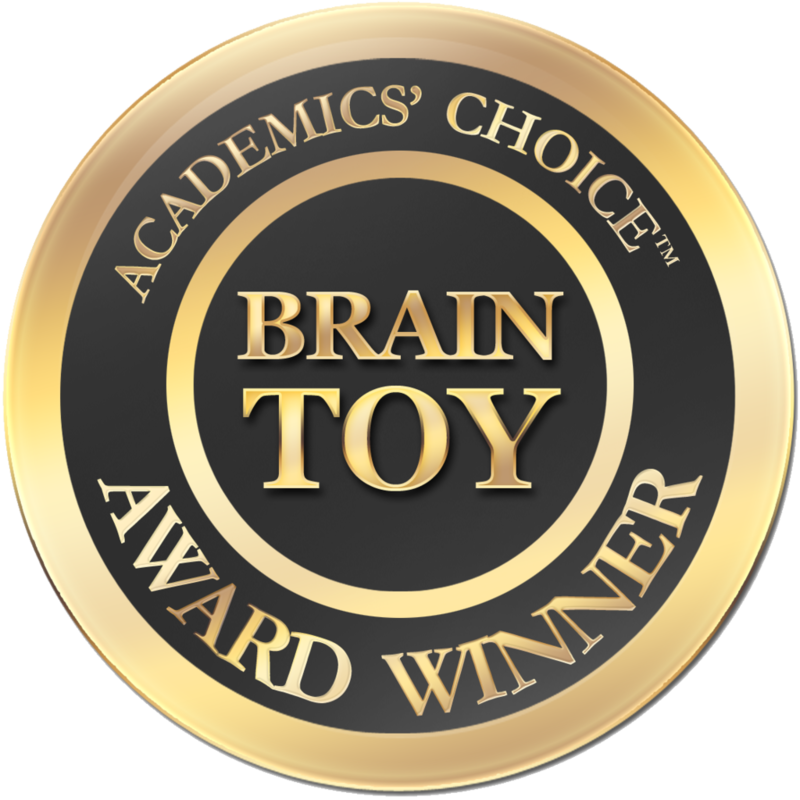 It recently won the Academics’ Choice award! http://www.academicschoice.com/games/holimaths-x-multiplication-set.php These are my thoughts and opinions. Enjoy! 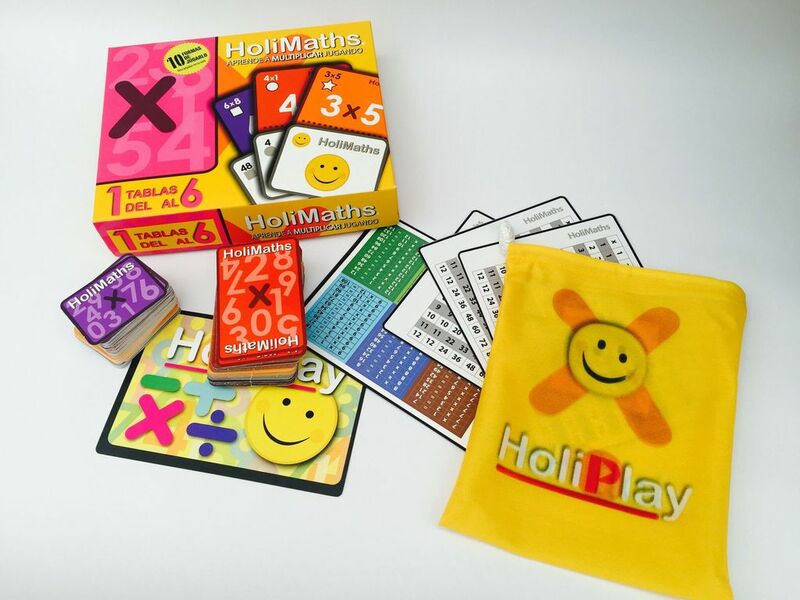 HoliMaths X, is an educational math card game for 2-6 players, ages 7 and up. The game time varies, depending on which option you decide to play, but can rage from 10-40 minutes. Players younger than 7 can play with the included “HelpCards.” The game center’s around the multiplication tables. One box covers numbers 1-6, while another box covers numbers 7-12. With at least 10 different ways to play the game, it is very customizable, and easy to adjust to help solidify certain multiplication skills. I will not be going over all 10 different ways of playing the game. For more information, you’ll be able to visit the website (linked below) to find out more information. 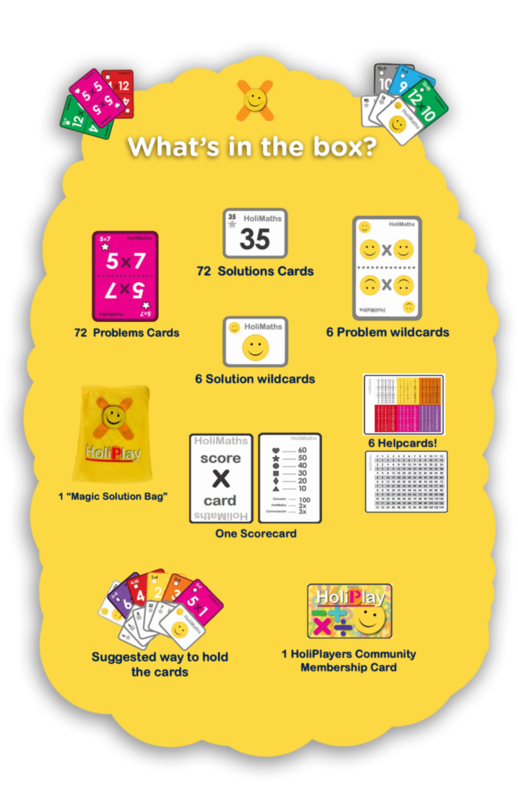 HoliMaths is a card game for families or educators looking to make an impact in their children’s or student’s math skills. As an educator, I have had the opportunity to use this game with a few of my students, with great results. For this review, I will go over the game play for the first two “options” of play. Each set of numbers include larger “Problem Cards” and smaller “Solution Cards”. Depending on the number of players, you will select that many number sets to work with for the game. For example, if you are playing with 3 players, then 3 sets of numbers will be used in the game. If playing a 4 player game, then 4 numbers will be used. First player can be determined by any means desired, however the rule say you can draw the top card from the Problem Cards and the first person to shout out the correct answer first becomes the first player. The Problem Cards are then shuffled together, and 6 are dealt to each player. The Solution Cards are placed in the “Magic Solutions Bag”, and each player will draw 6 from the bag. Each player places one Problem or Solution Card type face up in the center of the table. This starts a discard pile for each card type. The game is ready! A player’s turn starts by drawing one Problem Card and one Solution Card. These cards can be drawn from either the draw deck and Magic Solution Bag, or from the respective discard piles. If drawn from either of the discard piles, only the top card is available. Once the player has drawn one of each type of card, that player must now match at least two Problem Cards with two Solution Cards. “Wildcards” (with the smiley faces) can be used to make any match between Problem and Solution Cards. If the player cannot match two Problem Cards with Solution Cards, that player discards at least one Problem or Solution Card from their hand, and play goes to the next player. If the player has at least two matches in their hand, that player may start playing those cards by laying them face up in front of them on the table. The player must say out loud what the Problem Cards is and what the Solution is that they are playing. If that player already has two matches face up in front of them, they are allowed to play with any card in front of any player, starting on the turn after they get their second match. Also, at the end of a turn, a player may place up to two Problem Cards (only one place in front of each other player) as long as that player has two “Solved” Problem Cards in front of them. No player may receive a Problem card from another player in this way if they already have two “Unsolved” Problem Cards in front of them. When this happens, if the receiving player has a Solution Card in their hand for the Problem Card that they were just given, they yell out “HoliMaths” and place their Solution Card on the Problem Card. This player now turns the cards sideways to represent double the points! The Commutative Property is also always in effect during the game. If at any point during their turn a player notices that another player has a Problem card in play that applies to a Solved Problem card in their play area, using the commutative property (for example: 5 x 2 is the same as 2 x 5) they may take the Problem card from the other player and place it under their own Solved Problem Card. This will earn the player triple the points at the end of the game! A player’s turn always starts with drawing one Problem and one Solution Card, as explained above. Here’s a fun twist: During a player’s turn, if they have a Problem or Solution Card that can replace a Wild Card that’s face up on the table, they may switch cards, taking the Wild Card into their hand. This Wild Card must be used to make a match during the same turn. A player’s turn ends with the discard of either a Problem or Solution Card, as done to start the game. As a penalty, if a player take more than two minutes to play, they must draw a Problem and Solution Card. If a player plays an incorrect Solution Card to a Problem Card, that player must draw two Problems Cards. If another player points out that an incorrect Solution Card has been played, they are rewarded with a Solution Card from the Magic Solution Bag for paying attention! They must also give the correct solution to the problem. The game ends when any player has an empty hand of cards and no “Unsolved” Problem Cards in front of them. They get 100 points for finishing the game first, and then the scoring begins. If, at the start of the game, any player can place all of their Problem Cards with all of their Solution Cards on the first turn, they receive an additional 300 points! Using the symbols in the corner of each Problem Card, and the included Scoring Card, player’s add up the Solved Problem cards in the play area in front of them. Points range from 10-60 points, with the extra bonus of 100 points for the first person out, the double points bonus for any “HoliMaths” Solutions, and the triple points bonus for any commutative property Solutions. This version of the game is similar to completing a multiplication chart in a grid format using the Problem Cards. To start, select between 3 and 6 number sets, using their Problem Cards and their Wild Cards. It is recommended that these number sets should be correlative, but selecting non-correlative numbers will increase the difficulty. For example, use number 1-3, 2-5, or 4-6. Or, if you have both set, you could use 5-7, 6-8, etc. Of the selected numbers, shuffle all their Problem Cards together, and Deal 6 cards to each player. The top card of the remaining deck will be used to start the grid. Reveal it and place it in its location on the table. This location is where that card would be if there was a grid spread out on the table, with each row and each column representing one number set. Each turn should be limited to one minute, to keep the game “dynamic and fun.” For an example of this option in action, see the linked video at the bottom of this review. For this game, cards may only be placed in the grid orthogonally adjacent to any existing card. Diagonals do not count. Players may only play one card per turn. If a player doesn’t have a card to play, they must draw a card from the deck. If the drawn card can be played, that player may immediately place it in the grid. Otherwise, they add it to their hand of cards and play passes to the next player. Wild Cards can be played in place of any other card. If on a player’s turn they have a card that can replace an already existing Wild Card, that player may replace the Wild Card with the correct card for that spot, and immediately place the Wild Card in a different location on the grid. As a rule, when a player plays a Problem Card to the Grid, they must also say the solution. If a player does not say the solution, they receive a Problem Card from the draw deck as a penalty. If they say the incorrect solution, any other player may say the correct solution, giving a Problem Card from their hand to the player that said the incorrect solution. 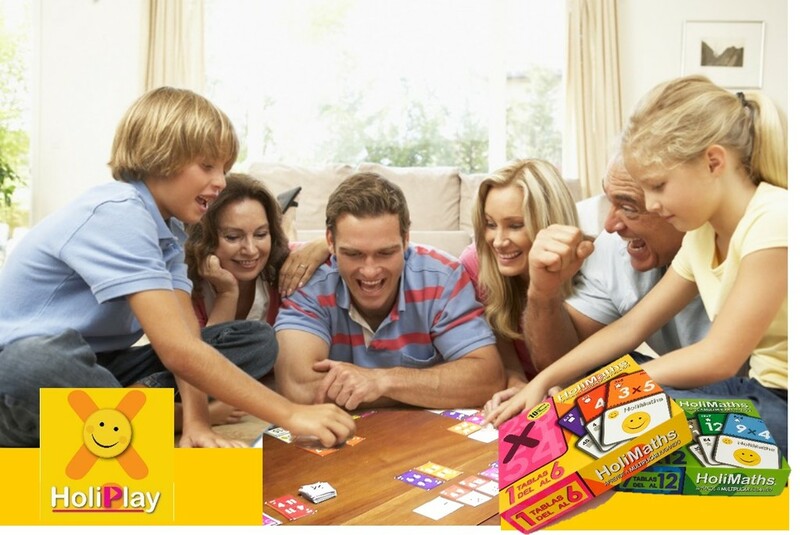 The game ends when a player runs out of cards in their hand. Scoring is done by using the included Score Card and adding or subtracting the symbols on the Problem Cards. The components are great! The symbols are clear. The numbers on the cards are big enough to see from across the table. Each card is set up very well, with the Problem Cards having the problem facing in both directions, helping the other players read them without the cards being upside down. The colors are vibrant, as well. As this is a game about math, the colors, the Magic Solution Bag, and variability of the game play options makes the game look fun on the table. I find it difficult to shuffle the Solution Cards in the Magic Solution Bag, almost wishing the Solution Cards were discs, which would making it easier to shuffle in the bag, however, they function better as cards. The rule book is ok. At points, I had to read certain parts a few times before understanding. However, as the rule book is still being developed, I’m sure the editing and refining of it will make the final rule book much better. Once you understand how each of the 10 ways to play the game works, it’s amazing. As an educator, I see a tremendous value in this system. As I mentioned in the beginning, I have been using HoliMaths with a few of my students, and I have seen each one of them improve their multiplication skills. As the game can be customized to fit each student’s needs, I was able to use only the number sets that the student was struggling with, and play the game with a very specific focus. One student liked it so much that he began developing his own variation of the game. HoliMaths offers parents and teacher an option for students that has much more meat to it than just filling out a multiplication table, or completing various worksheets. Students use their brains to figure out the problems in their head, or with the HelpCards, but as they play they are given visuals to call upon the next time they play, or come across the problem in their homework. One of my students has struggled with the number 8 in his multiplication work. While playing some variations of HoliMaths with him, I have seen his recall of his 8s multiples continue to improve and get stronger. I can’t say enough about how well it has helped, and how great the customizable nature of the game fits for each student. Set up is easy from game to game, as well. 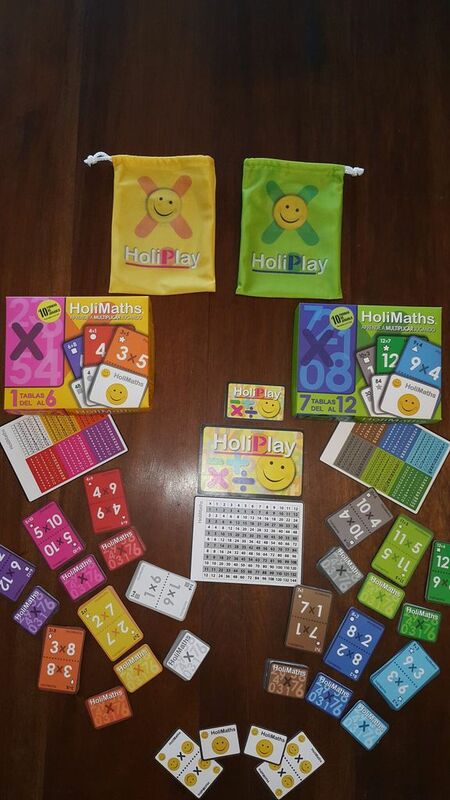 HoliMaths is a great addition, or alternative, to help learn the multiplications tables for number 1-12. It is extremely customizable, very helpful, and easy to get to the table. The cards are of very good quality, so they will last long. The variations in gameplay offer so many ways to help students, or children, learn, not only with their mental math skills, but by giving them visuals to use later. An excellent game, but an even better learning tool! Copyright 2016 HoliPlay. All Rights Reserved. This entry was posted in Preview Reviews and tagged board, board games, card, card games, games, holimaths, holimaths x, holiplay, matias, matias roman, roman, x. Bookmark the permalink.